All Seated Liberty Dollar dates and mints are rare and worth at least $250 in the lowest grades. 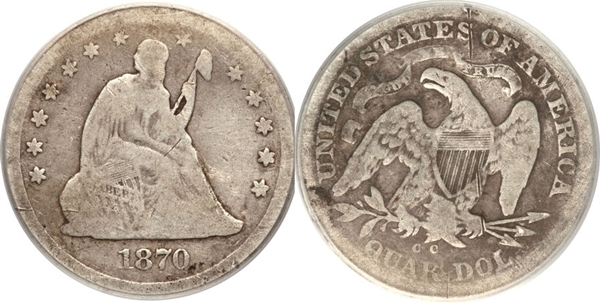 A high mintage for this series is 1,105,500 for the 1872 and valued at $250 in G4 (Good) and a low mintage can be as low as 1,100 for the 1852 and valued at $20,000 in EF45 (Extremely Fine). Typically the lower the mintage the more valuable but the 1873-S has a reported mintage of 700 and none have been discovered, then you have other rarities in this series that make it impossible to complete. If you want to buy Seated Dollars for less than $250 then you will have to buy holed, damaged and well worn examples, because these coins are valuable in any grade. Seated Liberty Dollar value is in the thousands for for most dates and mine in AU (About Uncirculated) and worth several thousand dollars in MS (Mint State, uncirculated). If you’re into the proof then expect to pay several thousand dollar for each of these as well, some only have a handful known so there’s potential for growth as these figures become widely known. With these high values you need to watch out for fakes, there’s many out there. The Cherry Picker’s Guide Volume II has 5 varieties listed for this series and they’re: 1865 Doubled Die Reverse (DDR), 1868 Misplaced Date (MPD), 1869 Repunched Date (RPD) 2 Versions, 1871 Misplaced Date (MPD). Mint Mark: None (for Philadelphia) below the eagle on the reverse. Seated Liberty Dollar Value. Seated Dollar worth. Civil War Token Coin Values © 2019. All Rights Reserved.